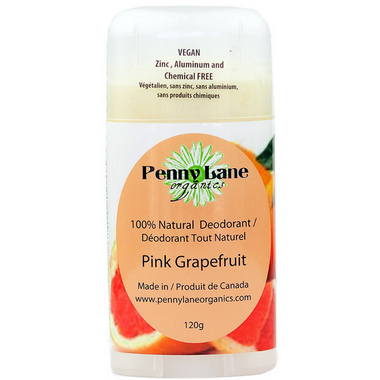 You've found Penny Lane Organics' best selling deodorant! This popular natural deodorant is made with four simple ingredients: pink grapefruit essential oil, cold pressed coconut oil, baking soda and organic cornstarch. Directions: Start with deodorant slightly over the edge to prevent breakage since there are no binders. Apply in 2 to 3 gentle swipes. Deodorant can be used dry or wet. NOTE: People often confuse baking soda with the baking powder which contains aluminum. Baking soda (Sodium Bicarbonate) does NOT contain aluminum. Store in a cool place. If deodorant gets too warm, the coconut oil will begin to change consistency. Simply place in the fridge and it will be good for use again! Warning: Do not use immediately after shaving or waxing the armpits or on the broken skin. Baking soda can be irritating to some people. If irritation occurs stop using the deodorant and apply a soothing natural cream or balm. This is a great product. I have been using it for over a month. However, now, the stick is crumbling, leaving clumps of product all over when I try to apply. It's really too bad, because the scent is fantastic and it really works! This deodorant is amazing. Iâ€™ve used the unsented, pink grapefruit, and lemon lime. The pink grapefruit is my favourite but all three work equally as well. Just like the directions and online video states, works best when adding a trickle of water to the head of the deodorant and only let a small amount up for applying. I have no issues with crumbling or anything. Since using this product, I have no body odour and never any pit rash. I can even go a full day without deodorant for what ever reason. The other chemically treated box store deodorant killed my pits and I would have to reply after every shower or I would stink right away. Not even a natural stink. Now I never have to worry anymore about my door and pits. My kids actually chance me around the house to smell the grapefruit pits. Haha. Iâ€™ll never go back to anything else. Nice smell, very crumbly, so when you're playing it, it isn't very smooth, and when you're putting the cap on or off you will sometimes get flakes falling off. But I do like how it is chemical free and it's a lot in volume for the price. It is crumbly, impossible to apply.I throw it right away . Really fabulous natural deodorant. Different application compared to chemical based deodorant (much more flaky) but once you get the hang of it, you will never switch again. Fantastic scent and works all day. This is my new favourite natural deodorant! I've been using it all summer and have zero issues with odour. It doesn't prevent wetness so much and there is some white marks on clothes. But, it doesn't build up on skin and clothes like another natural brand I tried. And the grapefruit scent is just fantastic! It's not overwhelming and fades into the background. I roll up just a tiny bit and run some water over it then apply gently. If you apply too much it tends to ball up and flake. Just takes a bit of getting used to. I will certainly be repurchasing. Love this product! The smell is fresh and crisp and it works! Before each use, a little water on the top makes for easier application. It can be crumbly but the water solves that problem and it's a small inconvenience when you consider the fact that you're no longer putting all those harmful chemicals on your skin. VERY happy with this product and I highly recommend! Horrible product, the texture is crumbly, impossible to apply, you'll end up with a crumbly paste on your skin and a lot of crumbles on the ground. The scent is great, otherwise this is poor quality and useless as it doesn't apply properly. Will never buy again. This deodorant works really well! It has a strong citrus smell. You have to roll the deodorant all the way down after each use or else it breaks apart when you take the cap off. Unbelievable smell and it works!! So far, I am loving this deodorant ! The initial smell is to die for. So juicy and fresh scented ! My one complaint is that it does break easily so when youâ€™re struggling with the lid (it is on super tightly), sometimes the deodorant within breaks which is frustrating because once you do get the lid open, it flies everywhere. Aside from that, I donâ€™t have any complaints ! Even with working out every morning, it still manages to last a decent way through my workout. Even on my more intense days it still isnâ€™t completely gone by the end (I obviously have to reapply after though, but thatâ€™s to be expected with a natural deodorant !). This is the best natural deodorant I have tried!! I've had no issues applying it, I just pop it on while still wet from the shower or run it under water first and it works beautifully. Most importantly it actually keeps me smelling nice the whole day, which has not been the case with literally every other natural deodorant I've tried. So happy!!! Penny Lane Organics is the only place I buy deodorant from now. Iâ€™ve been alternating grapefruit and tea tree lemon for at least a year. I followed the advice from others to run it under water to wet it before use so it doesnâ€™t crumble, and rub it in with damp fingers. The few extra seconds applying is worth the product safety and long lasting freshness, no reapplying needed! This deodorant smells absolutely amazing! It smells like fresh-pressed grapefruit, but is not too fruity for a guy to wear. My husband uses it, too. It's a very uplifting, happy fragrance. 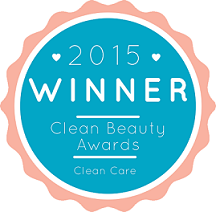 Because of its all-natural ingredients it does require a little bit of effort to put on. What I do is put it on right after stepping out of the shower, rub it on to wet skin, and then massage it in for a few seconds. Or I dampen it under the tap and then put it on. It really does need to be damp or wet to apply properly. And it also does leave a white residue, so be careful when putting on dark clothing. This stuff smells so nice though, it's worth the extra minute in your day to apply it! This really impressed me! I think the grapefruit scent is something that really helps to make it last. I have been using this now since the summer and couldn't be happier with the results. Yes, there is a learning curve with respect to how to apply it without making a huge mess but once I figured that out, I found this product to be exactly what I was looking for. My trick is that I actually put it on IN the shower, after I've turned off the water and dried myself off. I leave my pits wet and apply before I step out. The key is to just do light strokes, once or twice and not lay it on thick. You will be in a heap of mess if you try to use this like a conventional deodorant. The only drawback I find with this product is that there is no anti-perspirant aspect to it but I suppose the only way to achieve that is to add in the toxic chemicals that we're trying to avoid here. Love the smell of this! I have bought it a few times already and will continue to. I love the scent, I love the natural ingedients, but the application of this deodorant is terrible. I've tried using it dry, I've tried wetting it as suggested, but it crumbles and more ends up on my bathroom floor than on my armpits! Will definitely not re-purchase. Love the smell and all natural ingredients...however I found it easier to apply if you wet it a bit. Love that there is only four ingredients in this deodorant. And I know what they all are. Run it under water quick before use so it doesn't break. This product actually works!! Keeps me dry all day. The grapefruit smells fantastic. Works well for me, usually add a little water so it doesn't break too much. Hands down the best all natural deodorant... last all day, does not stay sticky like others... I never have to reapply! This scent made my husband smell "funky". I gave it a try and didn't have problems with smell and I thought it worked well and lasted at least 8hrs. Unfortunately on dark sleeveless shirts it leaves white marks. My husband prefers the Tea Tree Lemon scented one. This works better than any other natural deodorant out there (And I've tried many). Great product! Does have a scent but dissipates quickly. Doesn't stain clothes. Will buy again! Ps. This works better if you pat it on, instead of rubbing it on. This is the first organic deodorant that I've ever tried and I love it! Will be ordering more from Penny Lane! I am new to using natural deodorants and this was one of the first ones I purchased. I really wanted to like it but it is so messy (chalky and clumpy) when I put it on and it gets all over my clothes. The smell is great and lasts all day, but the application is very troublesome. I really really want to like this and think it smells absolutely divine and does the job of odour control. However, it leaves the most awful white streaks on my shirts. I've tried waiting a few minutes before putting my top on but after I pull my shirt over, lo and behold; there are several white streaks and I have to throw my shirt in the laundry. :( I'll still use it but will be looking for another once it's done (which might not be for some time judging by the size of the tube!). I used to have another natural one made with coconut oil- it didn't smell as good but at least it didn't leave white streaks. This is one of the first organic deodorants that works for a full day sweating on my body!! I have tried a LOT and they all barely. Work past a few hours , this one is AWSOME. some people I notice complain that it's crumbly a bit which it is .... slightly ...but if you want a nice green deodorant I HIGHLY recommend this one it really does work ....... and I sweat a lot usually and have had a HARD time finding something ... this is it ! I originally said this is the holy grail. Unfortunately, this product is so crumbily I've already lost half of the product from it falling on the floor opposed to going on my body. Love the simple ingredients in this deodorant. Although it does crumble easily (i've found it crumbles less when applied after a shower), it does a great job at controlling odour and I will continue using this product. the smell is amazing and it lasts all day. would recommend!!! Really like this product! I rub a tiny bit of water over it before applying as it's quite dry otherwise but that little bit of moisture makes it slide right on - smells great, works great - highly reccomend! My favorite natural deodorant by far! I love the scent and it is the only deodorant that keeps me smelling great all day. You need to follow the directions on how to apply it properly - a little water to help it glide smoothly and not crumble. I have also tried the Lime scent and it is great too! This deodorant was super crumbly and the grapefruit smell was so STRONG! It actually irritated my skin. I am very pleasantly surprised by this deo. I wanted an all natural deo without all the added junk in it while I'm breastfeeding my baby. I was skeptical of whether this would actually work, but it does!! The grapefruit smell is amazing and it keeps odor away just as well as my other Secret deo. It goes on smoothly and I haven't had any issues with it crumbling so far. This will be my new go-to deo, even when I'm finished breastfeeding. Love this deodorant! The scent is beautiful and wakes me up in the morning! I do rub a small amount of water (a drop or two) on it before use to soften it slightly for easier application but that's very minor for all the other things I love about it. Very happy with this purchase! Best working natural deodorant I've ever tried! Only downfall is that the product easily crumbles but it is a small price to pay given how well it works and that it is free of binders and other chemicals. Truly love it!! Excellent product, one of the best natural deodorants I've used. Long lasting, great smelling. Love it! doesn't leave a residue after shower like other popular brands, is economic because you need to apply less and can pass one day before reappling and it's really soft for this area. Only thing, would try another sent for the next purchase because this one is not my favorite. Try it! Love the scent! Put me in the good mood in the morning! I absolutely am in love with this deodorant! This grapefruit scent is so fresh and I love putting it on in the morning. I find that I don't always need to reapply and if I do its at the end of a busy day. Such a great product and it will last forever because you only use a tiny bit each time and the stick is 120 grams. LOVE this product!! Out of anything I've ever tried, ever, including regular non-organic/natural brands, this is the one that does it! Even when I'm sweating, it takes a lot for me to notice any trace of odour. For the most part it also keeps me dry so that's not even a problem. It smells amazing, and as long as you use it properly (raise it just barely above the plastic line--follow their instructional video on youtube, too, it's impossibly easy--and wet it so it doesn't crumble) you won't have any trouble and it will last you a century. Barely even need three swipes to do the trick. Thank goodness for Penny Lane. I love this deodorant! I tried it and then loved it so much I ordered three more. I watched a YouTube video to learn how to use it, a little dab of water helps it apply nicely. I find it works better than chemical antiperspirant or deodorant, I am always dry and never have a bad smell, only ever smell pleasant! I recommend it to everyone! It goes on great and usually only needs to be reapplied on hot days. The scent is also very nice and not overpowering or strong which I like. Best natural deodorant I ever tried. Love the scent. It keeps me dry all day.